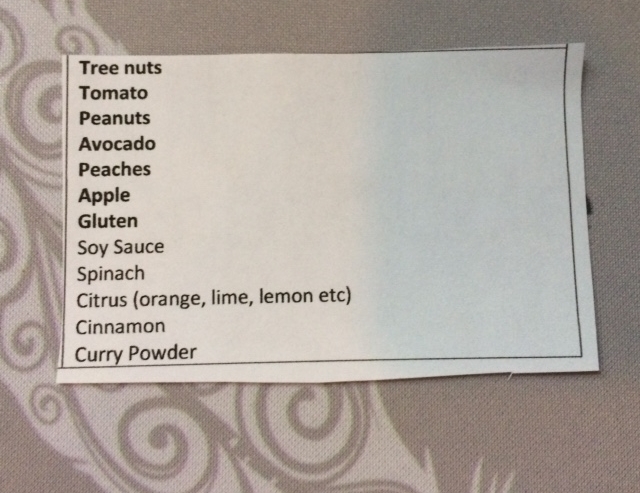 One of the most important tools I carry with me is this list of my food allergies and restrictions. The items in bold are those that can kill me or make me very sick. I have to avoid the others as part of my required low histamine diet, but will not immediately make me sick. I can easily hand one of these to the server in a restaurant, to a meeting planner where meals will be planned or to anyone who may be involved in anything I will eat. When I travel to a country where English is not the first language, I translate this list into the local language and print several copies to provide at restaurants, etc. Finding allergy-safe restaurants requires different techniques in different places. When in major US cities, I often use a combination of a Yelp and a TripAdvisor search. Luckily, the search features on both of these sites allow keyword searches. I usually start with entering "gluten free restaurants" near my current location. Once that list is available, I use a keyword search for "allergy" or for a specific allergen, such as "tree nut." If I find a couple of restaurants I like, then I check out their menu to see if they offer a lot of complex dishes that include my severe allergens. I usually offer to select the restaurant for a social or work outing due to the 15-30 minutes this process can take. No matter how carefully I select, though, I always bring my printed allergy list and discuss the restaurants ability to accommodate my food allergies (sometimes I even call in advance). If I cannot select the restaurant, then I always call in advance to speak with the manger or chef. Shrimp Scampi with Zucchini Noodles - delicious and easy, but not for people with shellfish allergies! Spiralize the zucchini and set it aside. Melt butter and ¼ tsp of salt in a pan. Add shrimp and sauté for 2-3 minutes. Add olive oil, remainder of salt and pepper and garlic. Add zoodles and sauté for 2-3 minutes. Makes 1-2 servings.